I participated in Choque Festival, but ended up dropping out and erasing much of my work. I had first thought about doing a work about violence and the need for empathy. Maybe if our police had a bit more empathy for the people they are meant to protect, they would kill less. However, when I got a better understanding of how the event was being conducted, I stopped painting, urged other artists to drop out as well by telling them what I was seeing, and erased my work. That erasure gave my piece a new meaning: dialogue, however necessary, is not easy. At Choque Festival, whatever the original intent, there was not enough dialogue. Choque Festival was organized by a man named Pagu, who made his name in the Rio street art community earlier this year when he managed the production for a world-record-sized mural by the Brazilian artist Kobra. After that, he severed ties with Kobra and started his own artist management and production company. Suddenly, he was producing large murals in luxurious cultural centers, politically engaged projects with Brazil’s top feminist symbol, works for Universal Pictures movies and appearing in photos with people like Gilberto Gil, a major Brazilian musician who once served as the country’s minister of culture. Kobra had already painted a portrait of a police officer at the same police headquarters when Pagu proposed the Choque Festival, but this event was supposed to be more than just decorating the walls of a police station. According to what I was first told, Choque Festival would be a politically engaged festival, raising serious issues like police violence in Brazil (particularly against people of color). If they managed to address topics likes that in a police headquarters, for me that would be a worthwhile project. And maybe in a certain way they did achieve that, but in such a confusing way that it didn’t make any sense to me. To the police, it seems like the festival was pitched as something positive for their self-image, while for the artists it was something between a Trojan horse and an attempt to have a dialogue. Already, the problem should be clear: these very different pitches can only both exist if there is in fact little dialogue between the police and the artists. Less than two weeks before the festival took place, Catraca Livre, a leftwing media outlet, published an article with notable São Paulo artists such as Ruy Amaral and Crânio quoted defending the importance Choque Festival. Only, I soon discovered that Crânio was not participating in the festival at all, and he did not even know that he had been quoted in an article about the festival. A few hours after he saw the article, it was edited and his quote was attributed to another artist, Mazza, who, by the way, also did not participate in the end. This same article was edited at least once more to add the disclaimer, “In spite of what was informed by the festival organization, Crânio will not participate in the festival.” In another news video released a month later, there are interviews with Pagu and with Crânio, who says he did not accept the invitation to join Choque Festival and that for him the whole event was more about getting some media attention than a real dialogue or an attempt to make the police respect street art. 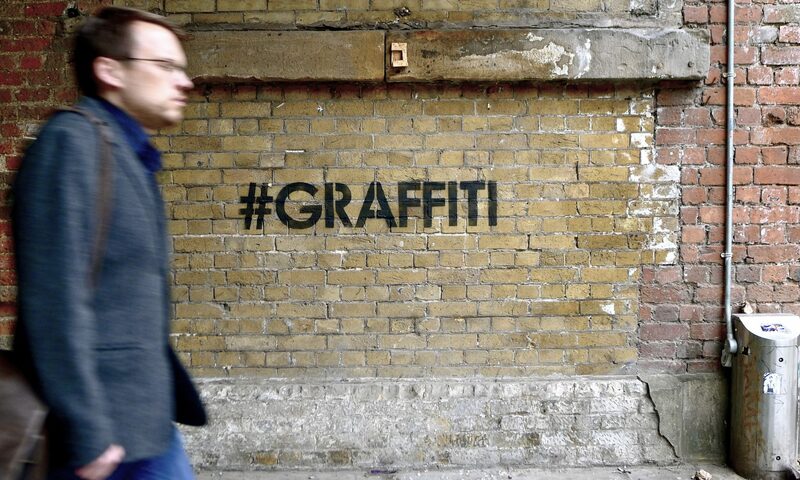 Instagrafite, a major street art platform on social media, was also involved in the festival, putting their name on a very strange official video and advertising the festival in its Instagram page. Instagrafite’s initial involvement gave some artists reason to sign on to the festival in the first place, by giving impression that the festival had a larger and a more street art engaged production staff than it ended up being the case. In truth, Instagrafite was more of a media partner than an organizing partner, and once they’ve realized the event was not what they had in mind and started to receive harsh criticism on their Instagram posts, they also dropped out. 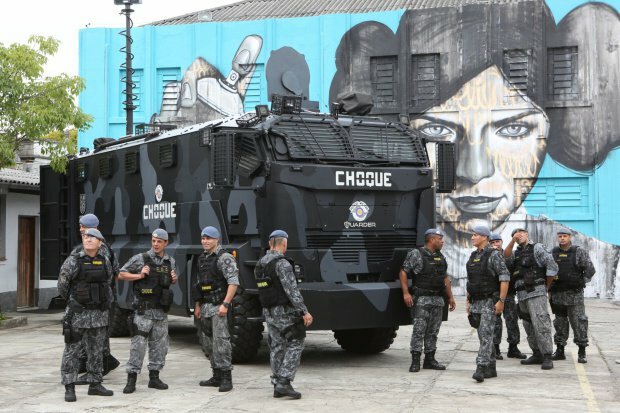 The same article that falsely used Crânio’s name ends with the statement that the next edition of Choque Festival will take place in a Brazilian maximum security prison. I believe that the interest in this project, at least for the Government, is not so much about promoting graffiti/street art as it is an opportunity for some good PR for oppressive state institutions in desperate need of looking more friendly. After all, street painting has long been used for gentrification strategies (New York, Miami, et cetera…). Would putting a good spin on state oppression be such a crazy extension (in a somewhat apocalyptic zombie style) of the same approach? I should say, I’m not against street art festivals or street painting. I believe much more in the importance of street art and murals than in most art institutions and gallery exhibitions. That’s why, despite some hesitation, I initially chose to participate in Choque Festival. I’d worked with Pagu before and I believed he was committed to politically engaged art, so I thought he was up to the challenge of holding a worthwhile festival in such a complicated space. We are living such a difficult, polarized, political moment in Brazil, and worldwide. A serious proposal for dialogue seemed like an important opportunity, although maybe too good to be true. I believe that the way a street art festival is developed, how it sparks conversation and engages with people, is more important than its concept or the final murals. 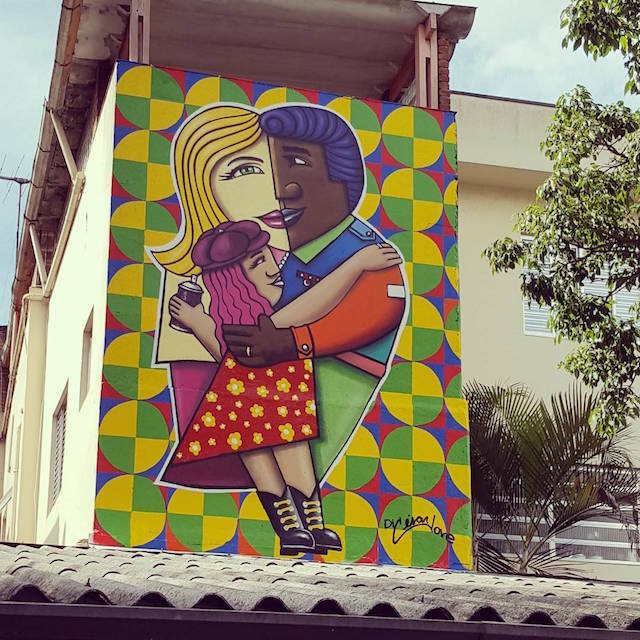 I’ve already seen interesting street art projects in police departments in Rio de Janeiro before, paintings about domestic violence made so that survivors feel more welcome in the station when they come to report abuse. There has also been at least one important art education project with the police in Brazil, made by Regina Silveira. In São Paulo and in Chile, I met artists who make murals in prisons, and it seemed like a beautiful proposal. But what I’ve seen in Choque Festival, and what most of the media confirms as the main narrative about the event, was pretty much a project that makes the police look more friendly without starting a deeper and continuous process of change. Internal issues of how the festival was organized, the Crânio story being just one particularly strange example, have the sense that the entire festival ran counter to what street painting and its unauthorized roots stand for. Of the fifteen announced participating artists, only six finished their murals. Most of the others dropped out because they felt their designs were being censored or because they felt uncertain about the entire festival. When I finally saw what the festival was really about, I dropped out too, but first I returned to the police headquarters to paint over my work and film the process. Di Cesar for Choque Festival. Photo from Di Cesar. Of the artists who did paint, there were two from Rio de Janeiro and four from São Paulo. Tito Ferrara painted a giant princess Leia holding a spray can, which was meant as a symbol of a rebellious army threatening the police as if they were stormtroopers. Wark painted a single mom with several kids around her, which could have a lot of interesting interpretations, but the fact that the woman is wearing a Brazilian flag with Choque Festival written on it makes the work’s message rather confusing for me. Thipan painted colorful letters with the phrase “In favor of peaceful dialogue, peace and light to men”. Petrus Fidalga covered a wall with wheatpasted self-help phrases, with a female cop and a little girl holding hands in the center of the wall. Di Cesar made a happy cop family. Those two works that present a very different idea from what I would imagine for a politically conscious street art event. Ruy Amaral did not paint, he just gave a lecture in the police auditorium about the importance of street painting. Tito Ferrara’s mural for Choque Festival. Photo by Paulo Lopes. 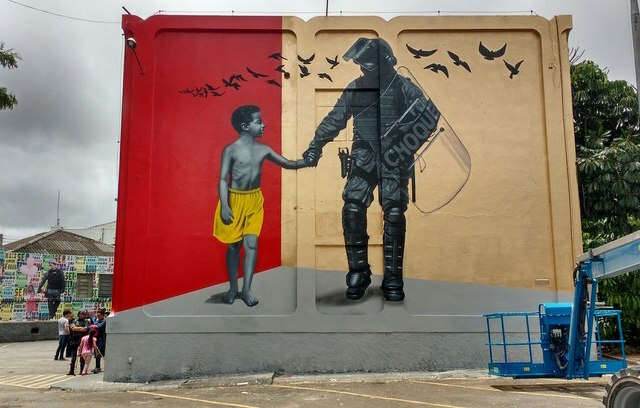 While nobody seems to have seem him paint it, Pagu himself signed a work where you see a police officer in riot gear holding hands with a black boy, a red background just behind the boy. If we interpret the red as blood, perhaps Pagu deserves a compliment for bringing the issue of black mortality to the police headquarters. But if you read the articles and see his interviews about the festival, he always explains that his painting expresses the need for cops to be connected to society. The festival is simply not clear at all about its meaning, which could be a good thing, but in this case I think it went too far. And yes, Pagu curated himself into his own festival, and while that’s not so unusual in Brazil street art/graffiti festival, it was unexpected. I first met Pagu as a producer, and was surprised to discover him as an artist too. In one TV interview, he’s described as a graffiti artist for more than 20 years, but no one that I can find ever saw a painting of his before, or even saw him painting the mural he signed. It was pretty much completed by the time other artists got involved in the festival. He does use a spray can in the festival’s official video, but that only reveals to anyone who uses spray paint that he’s not a professional with it. Pagu may or may not be a long-time painter, but for the way he initially persuaded people to join his festival, me included, he’s definitely the best salesman I’ve ever seen. Maybe that’s his real artwork. I believe we need more than a few days at a wall to overcome the abyss that separates people who live in vastly different bubbles. We have one of the world’s deadliest police forces and they have an extremely high suicide rate, so it does seem like something has to be done about the relation of our police and our society. Art can be essential in this process, but art without meaning, without context, can easily turn into just marketing. That’s my vision of what happened at Choque Festival. Now if only the press and the sponsors would notice so that this mistake isn’t repeated. Previous PostPrevious America is still here.